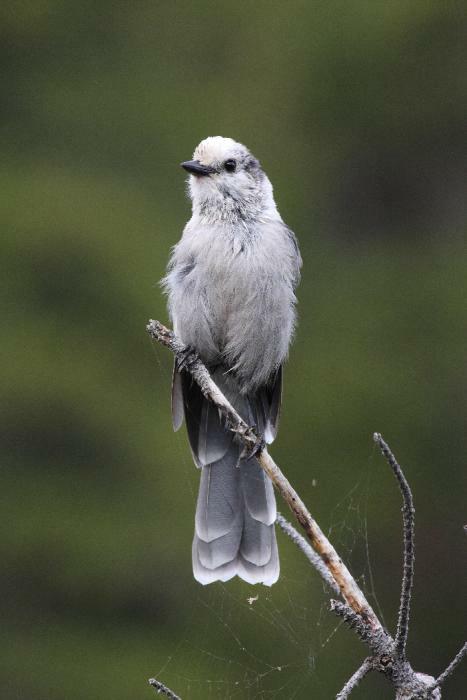 The Gray Jay is native to North America. I took a picture of this one at Yellowstone National Park in Northwestern Wyoming. From the location of the bird, I figure that it is probably a member of the subspecies Perisoreus canadensis capitalis, which, according to the Gray Jay article on Wikipedia lives in the southern Rocky Mountains in the area of Yellowstone. I am not a bird expert though, so I would appreciate to hear from anybody who has a correction. Gray Jays are members of the family Corvidae which, in addition to the other jays includes crows and magpies. This particular bird was overlooking a parking lot and bathroom area. Living in a Salt Lake City, Utah, suburb, Yellowstone National Park is a drive of about 6 to 7 hours away. It is a great place to photograph wildlife. In addition to the wildlife, Yellowstone is famous for the geothermal activity including geysers and hot springs. For this picture, I used my Canon EOS 40D with a Canon EF 100-400 ƒ/4.5-5.6L IS USM lens, which for this photo was extended all the way to 400 mm. The selected aperture for this portrait was ƒ/7.1 and the ISO was set to 640. This allowed me, assisted by the lens's image stabilizer, to get this hand-held shot at 1/400 second as well as a few others just in time before the bird flew off.